Natural, safe, and effective therapy for scar pain. Using a holistic approach to treatment. The appearance of scars can improve, scar pain can be reduced, and overall chronic pain from the scar can be treated. Got painful scars or looking to lessen their appearance? Scar treatment might be right for you. Scars are often a permanent reminder of surgery, trauma, a burn, or wound that has not healed properly leaving dense fibrous tissues on the skin. Scars can be skin color, red, purple, or even pearly white and can lead to pain. Scars are formed when the wound healing process is disrupted by factors such as too much or too little collagen production. In a Chinese Medicine view of scars, they are a disruption in the normal flow of energy. This disruption can lead to local inflammation and pain as well as distal, downstream, issues. The establishment of proper flow thru the scar can lead to healing, pain reduction, and overall well-being. Treatment in and around the scars involves the injection dextrose or other natural substances in and around scars to promote healing and reestablish cell signaling in the scar and increase functioning of the tissues. It is thought that trauma can affect scars and nerves and with scar neural treatments, it can lead to instant and lasting resolution of chronic pain. Cupping can also be used in addition to injection therapy to loosen up tight muscles and adhesions around the scar. Case study. 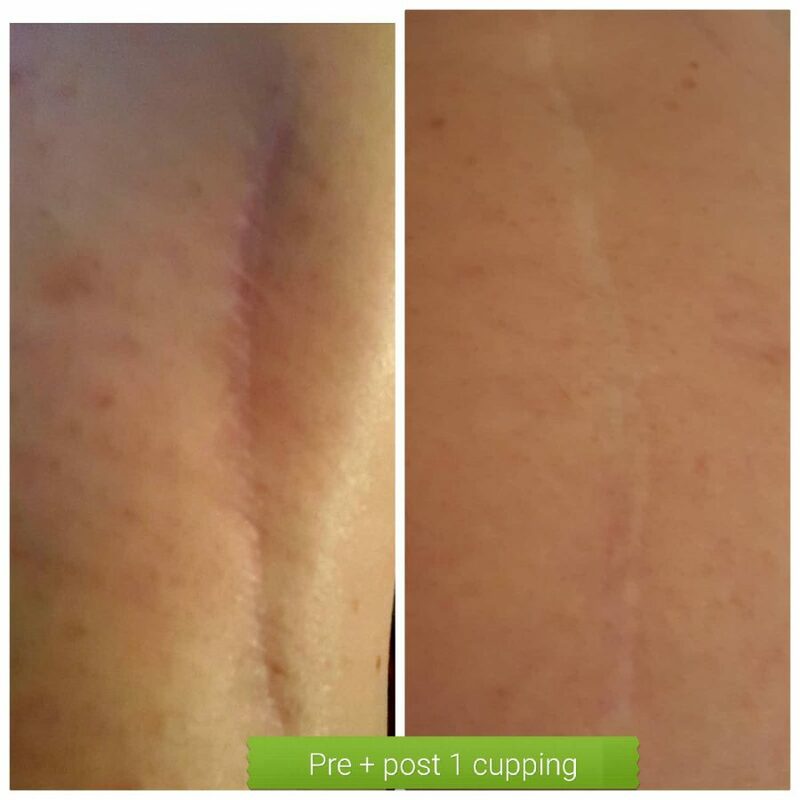 This is a before and after one cupping therapy session to address a painful surgical scar along IT band on upper leg. The scar was leading to hip and knee pain, reported as 6/10 pain. This patient noticed significant reduction in color of the scar and pain after one session. After four sessions, patient reported rare and 1/10 pain. Results seen after initial treatment and 6 sessions is recommended for pain reduction and improved appearance of the scar. More complex scars may require more sessions. Scar treatments are typically 15-30 minutes. This services is not covered by insurance and treatment packages are available. To schedule your scar treatment therapy, please call the office at (425) 686-4498 or schedule online at Starting Point Acupuncture.